Honolulu has joined the ranks of world cities that have implemented a bike share program. The program is called “Biki” (like wiki, get it? ), and there are 100 bicycle stations in Honolulu, spanning the urban corridor from Kalihi to Waikiki. It is a new mode of transportation, and one that is being embraced by residents and visitors alike. There are more than 1000 cities worldwide with bike-share programs, from cosmopolitan Paris, France, to humble Topeka, Kansas. By implementing the Biki program, the City & County of Honolulu is demonstrating a commitment to solving traffic congestion with “green” or eco-friendly responses to the challenges posed by an ever-increasing urban population. And it’s encouraging people to get out and enjoy a healthy lifestyle. For visitors in particular, the Biki program affords a sensible transportation alternative to TheBus or renting an automobile. The savings on parking fees alone are worthy of consideration. For visitors in Waikiki, Biki precludes the need to rent a car, as Biki stations are many, and all are within walking distance from any destination in town. All of the Biki stations in Honolulu are located in the relatively flat space of Honolulu’s urban core, so riders needn’t fear punishing hill climbs or white-knuckle downhill stretches. The fleet of Biki bicycles is more than 1000, and is likely to grow as demand and public awareness increase. The program was introduced with moderate fanfare, but its popularity and sheer ease-of-use has seen the number of stations around Honolulu grow significantly. There are several fare options for riders to choose from. The $15 Monthly Pass provides an unlimited number of 30-minute rides, best suited for regular, short rides. Most popular among Honolulu residents is the $20 Free Spirit Pass, which allows 300 minutes of ride time over days, weeks or months. The $25 Monthly Pass provides a full month of unlimited 60-minute rides. For most visitors, however, the $3.50 single ride fare seems the smartest option. It’s perfect for a ride around town, without being locked in longer than the duration of your vacation. 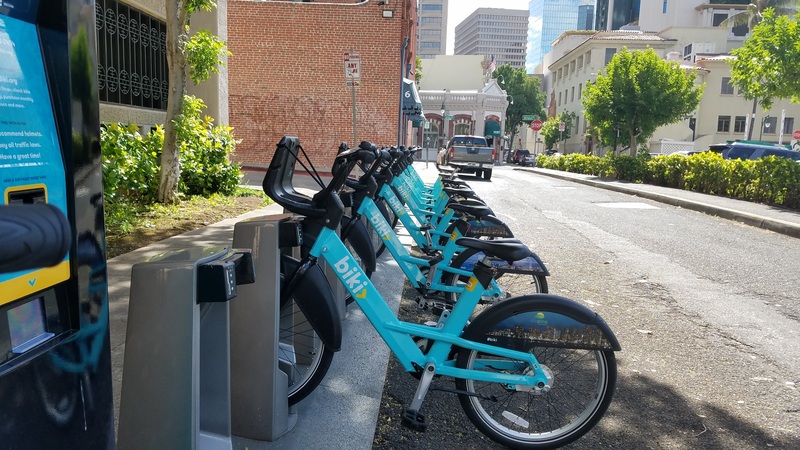 One of the biggest selling points for visitors to use the Biki program is that it allows visitors to experience and patronize local small businesses that might otherwise be overlooked from the window of a rental car or the bus. Most businesses have welcomed the Biki stations near them, as it helps increase foot traffic around their establishments. Many restaurants, retail outlets and galleries have seen at least a moderate uptick in their businesses. Of course, safety is the primary concern of the Biki program. There is a dedicated bicycle lane that runs along King Street from Downtown Honolulu to the University of Hawaii area. Plans are underway to further improve bicycle safety in Honolulu, making it ever easier and safer to use the Biki program. Riders should always observe the rules of the road. Most Honolulu residents who use Biki wear safety helmets. And it really couldn’t be easier for visitors to use the Biki. All it takes is a debit or credit card at any of the 100 kiosks deployed throughout Honolulu. The user interface is easy to operate. The bicycles are 3-speed, with adjustable seats and a basket to hold your beach or shopping bag. For trips around town, Biki is a sensible, affordable, and healthful transportation option for visitors and residents alike. Go for a ride! Visit www.gobiki.com to learn more and get rolling.